The Sixty Best Episodes of XENA: WARRIOR PRINCESS (Number Three) | THAT'S ENTERTAINMENT! I have chosen the best 60 of the 134 produced episodes. Of course, these are all subjective. For those who are familiar with the series, I hope my points-of-view will prove fascinating and perhaps inspire you to reexamine your favorite, or perhaps least favorite, episodes. For those who are unfamiliar with the series, this list might spark your interest and give you some places to start. Because the series did so many different things over the 134 episodes, Xena is the type of show that requires multiple viewings to be properly assessed. The ranking is subjective. If a particular story strikes your fancy, I encourage you to give it a try! In fact, contact me and I will be able to hook you up. With all that said, let us resume with episode number three on the list. We’re finally into the top three with one of the most important episodes of the entire series. “Callisto” not only sees the introduction of that titular villain, but also of the character who will become Xena and Gabrielle’s greatest friend: Joxer, The Mighty. 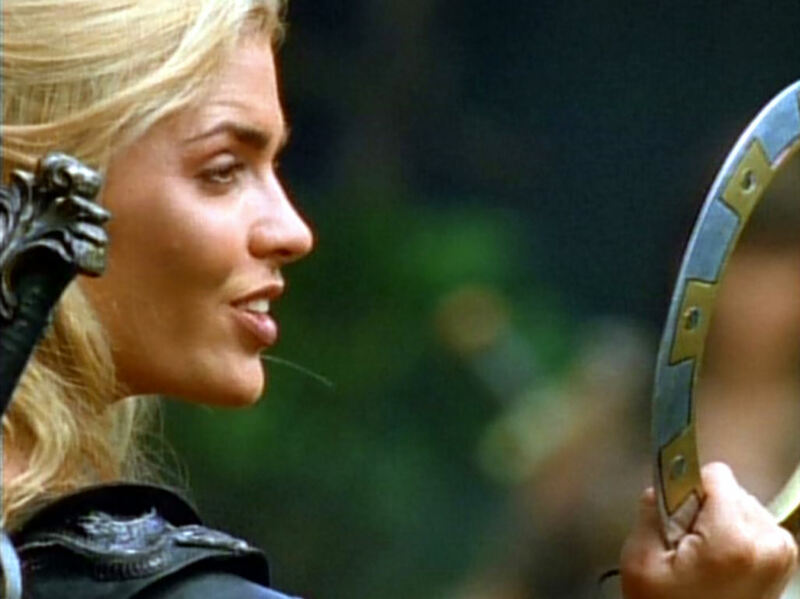 Beyond that, “Callisto” is so directly connected to the series’ premise — Xena’s atonement for her past evils — that it might just be the best episode for curious new fans. Furthermore, this episode houses some truly stellar performances and (most thrillingly) one of the more memorable action sequences of the entire series. Xena learns from Melas, a man whose family has been murdered, that a woman is plundering villages under the alias of Xena: Warrior Princess. On their way to confront the impostor, the duo are harassed by a bumbler named Joxer, who offers his warrior services to Xena. She rebukes both him and Melas, who attempts to assassinate her, thinking that she’s the one who murdered his family. Xena arrives in the next village and finally confronts the woman, a blonde named Callisto, who reveals that she’s the one who shot Xena with the poison dart in “The Greater Good.” After Callisto runs off with Xena’s chakram in tow, Xena puts the punch on Callisto’s right hand man, Theodorus. He tells Xena that Callisto’s family was killed by Xena’s army when they raided and burned the village of Cirra many years ago. Callisto is now seeking revenge by attempting to tarnish the Warrior Princess’s reputation. 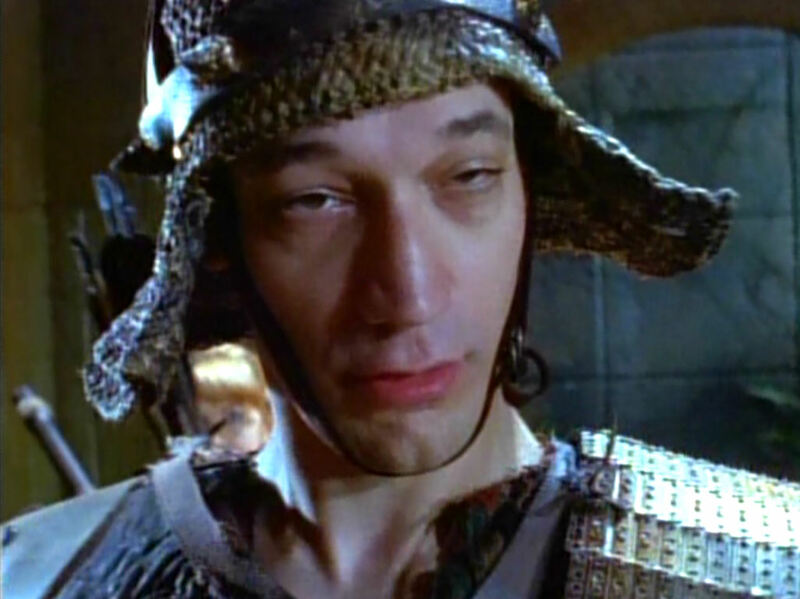 Theodorus also reveals that Callisto’s headed to murder the Oracle of Delphi and pin the crime on Xena. Melas has witnessed the whole thing and apologizes for his error. He decides to travel with Xena and Gabrielle. Meanwhile, Joxer visits Callisto’s hideout and asks to be a part of her army. After laughing at him, Callisto tells the fool that he must prove himself to her — by capturing Gabrielle. That night, Xena and Gabrielle have a heart-to-heart by the fire, and Xena tears up as she recalls her responsibility in the burning of Cirra. The next day, Xena is able to successfully prevent the Oracle’s assassination and chases Callisto out of the temple. After a lengthy run, Xena captures Callisto and takes her prisoner. Meanwhile, Joxer’s attempts to capture Gabrielle go nowhere and she beats him up. Gabrielle meets up with Xena and Callisto, as Xena, out of guilt, briefly considers letting Callisto go. But Callisto tells Xena that she’s just going to dedicate her life to killing everything and everyone that Xena loves. 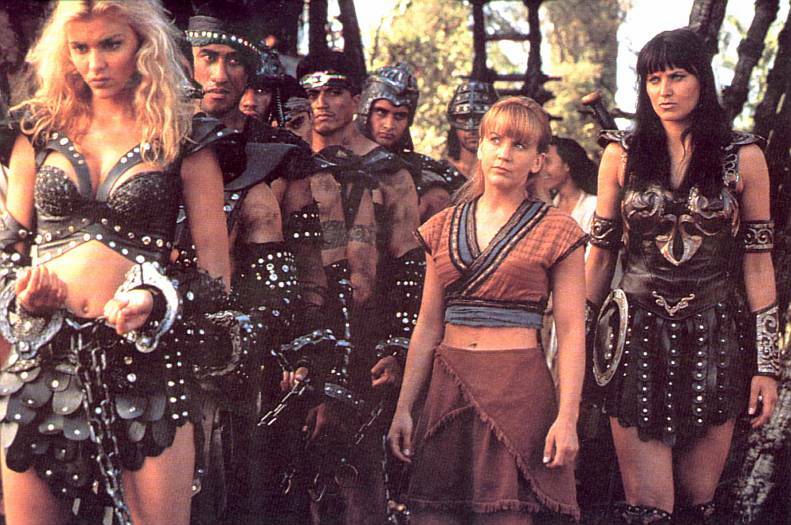 Xena takes Callisto back to the jail, but Melas leads a lynch mob, hungry for Callisto’s blood, and torches the prison. Callisto manages to escape and captures Gabrielle as she rides off. As Xena trails Callisto, Joxer returns to Callisto’s hideout, hoping that Gabrielle’s capture will secure him a spot in her army, insisting that he “softened her up” for Callisto. The skeptical “Warrior Queen” offers Joxer one last chance to prove himself — by slitting Gabrielle’s throat. When he can’t do it, Callisto ties him up as well. Xena arrives to find Callisto ready for a battle. She hoists Gabrielle up in the air via rope and lights the rope with a torch. If Xena wants to save Gabrielle, she’ll have to do it fast. Xena and Callisto battle on this fortress of ladders. Xena creates a seesaw and is able to save Gabrielle from death. She also saves Callisto from death, much to the latter’s chagrin. Melas, wise to the harm his blind hatred has caused, agrees that Callisto will have a fair trial. Gabrielle wonders if Xena did the right thing by saving Callisto, as Callisto grins maliciously. The character of Callisto is often cited as the series’ best villain. It’s not difficult to see why. Not only is she the living embodiment of the pain and destruction that Xena’s past evils have caused, but she’s another crazy leather-clad babe with a chip on her shoulder. Actress Hudson Leick is sublime as Callisto –the most nuanced of all the performers on this series. She motivates every choice, but manages to consistently surprise with her deliveries. 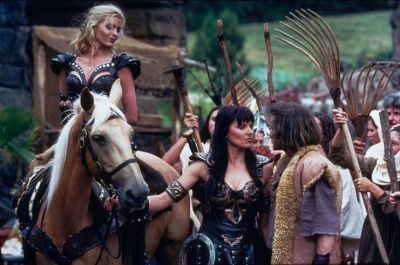 The scene in which she’s bound on horseback and Xena almost considers letting her go is one of the episode’s best moments: raw and real. Speaking of raw and real, the scene between Xena and Gabrielle in the campfire might be the best from the entire slow-moving first season. Lawless later said that when discussing her army’s attack on Cirra, she used sense memory and imagined the scent of burning flesh. This is a home-run scene, and a home-run episode for both Lawless and the Xena character, as the latter meets a human being whose suffering she’s responsible for, and whose suffering has since led to the suffering of many others — like Melas. I don’t think any conflict — though Xena’s often has to face the consequences of her past mistakes — was as precise as the one presented by Callisto. “You made me,” she tells Xena. Meanwhile, Joxer, clearly a buffoon from the start, begins by trying to prove himself as a warrior. When Xena scoffs, he goes to prove himself to Callisto. But after a talk with Gabrielle, and later getting his behind saved by Xena, he decides to become an ally of theirs. A lot of fans were repulsed by his inclusion at the time; they didn’t want to see anything come between Xena and Gabrielle. But his presence added a lot to the series. He gave the series humor, allowing Gabrielle to move from comic relief to full-fledged developing heroine, and an equal player in the stories. Furthermore, Joxer opened up the series to many more stories — often times serving a legitimate function. Fans can say what they will, but he was an integral part of the series. Even though some of the scenes I mentioned above are exquisite, certainly the most memorable is the ladder fight sequence, which is incredibly hard to describe, but mesmerizing on film. Again, definitely one of the best fights of the entire series. Great action combined with truly stunning character moments make this episode a landmark achievement. Given its precise connection to the show’s thematic roots, “Callisto” is the perfect dramatic episode for first-time viewers. It’s ideal for understanding the characters. Not surprisingly, it was re-run right before the series finale in ’01. It’s quintessential Xena. Come back next week as we reach number two! And tomorrow begins a new month-long series on Film Friday! I watched this episode 1000 times and I still enjoy every seconds of it. Great episode!!! i love callisto a top 3 episode for sure. I love rewatching it. Sometimes i wished it was longer the episode, as it really leaves you wanting more. Pingback: THE XENA SCROLLS: An Opinionated Episode Guide (121 & 122) | THAT'S ENTERTAINMENT! Pingback: HAPPY 20th! The Best of XENA: Allies Edition | THAT'S ENTERTAINMENT! Pingback: Following XENA: The Warrior Queen (III) | THAT'S ENTERTAINMENT!